The Assembly rotation axis can now be defined by selecting points in the visualisation, with both the moving and reference components defined in their final position; this avoids the need to define a co-ordinate shift. The Include Model facility has now been extended to include additional model data. Extended capability and coverage of the cutting facility. Provides the ability to highlight where duplicate thermal nodes exists between primitives, thus helping in model validation. Improvements to renaming geometry and deleting entities, and a mechanism to report references to a selected entity. On selection of the planet, given a date and time, Workbench now provides appropriate data for Sun Planet Distance, Solar Declination and Sun’s Right Ascension. Supports the definition of time- and temperature-dependent Properties. General Properties are defined which can be a function of two or three independent variables; these Properties can then be used in the thermal model to add additional thermal control behaviour. Allows different thermal cases to be analysed with different sets of conductors. 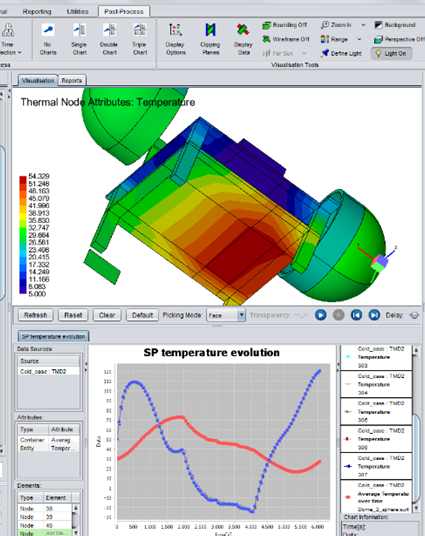 flexibility of running separate steps of the thermal analysis process has been increased. The post-processing capability includes the presentation of the thermal results using charts. The tight coupling between the geometry and post-processing makes it very easy to select geometry and generate charts, including heat flows between geometry components. Extended to include control of the output of user-defined nodal entities. In addition, the results within the TMD file can be viewed as the solution is progressing, rather than accessing only once the analysis is complete.